Recent studies have shown that, in an alarming trend, students are now turning to prescription drugs to cope with the stresses of college life. It is becoming a common story: It’s the week of midterms, and students have five exams and three papers crammed into four days, so they buy a few Adderall pills. Once they’ve taken them, the pills allow them to stay awake longer and focus better on their work. The pressures of college are enormous, and the stress on students is unmatched. Accompanying the assignments and due dates are all-nighters and last-minute cram sessions, and students are finding new ways to cope with the workload. attempts to achieve perfect grades and to keep up with their busy schedules. Illegally buying and using prescription medications to help them study, students prefer drugs-of-choice Adderall and Ritalin, which are typically used to treat people who suffer from attention deficit disorder and attention deficit hyperactivity disorder. Dr. Brian McDonough, medical editor for Philadelphia radio station KYW 1060, said this trend is growing. More than 7 million people abuse prescription drugs – drastically more than the people who abuse cocaine, heroin, inhalants and hallucinogens combined. In addition, more and more students are turning to prescription stimulants for their seemingly beneficial effects. Students use Ritalin and Adderall to help them study and report a heightened ability to focus and complete tasks while on the drugs. The medications allow students to pull all-nighters to complete schoolwork. In addition to increased focus and extra energy, both drugs decrease appetite, making them popular diet pills among female students. These medications work to change brain chemistry and alter mental and physical states, but for students buried under mountains of class work, the benefits may seem to outweigh the risks. Parents and health officials urge doctors to be more selective with their prescriptions and to watch for people who refill prescriptions too frequently, in case they may be selling their medication. The Drug Enforcement Agency stresses the importance of understanding possible side effects of taking prescription medication for any reason other than to treat diagnosed medical conditions. According to the agency, prescriptions that are used for non-medical reasons can have dangerous and sometimes permanently damaging effects. Adderall is a prescription stimulant that works to enhance brain activity to treat ADHD and similar disorders. It’s typically taken in pill form and once digested, enters the bloodstream and travels throughout the body. It increases the brain chemicals norepinephrine and dopamine. According to the DEA, Adderall acts to increase breathing, blood pressure and heart rate while constricting blood vessels. The effects are increased feelings of focus and alertness. People who regularly take the medication also report boosts in energy. 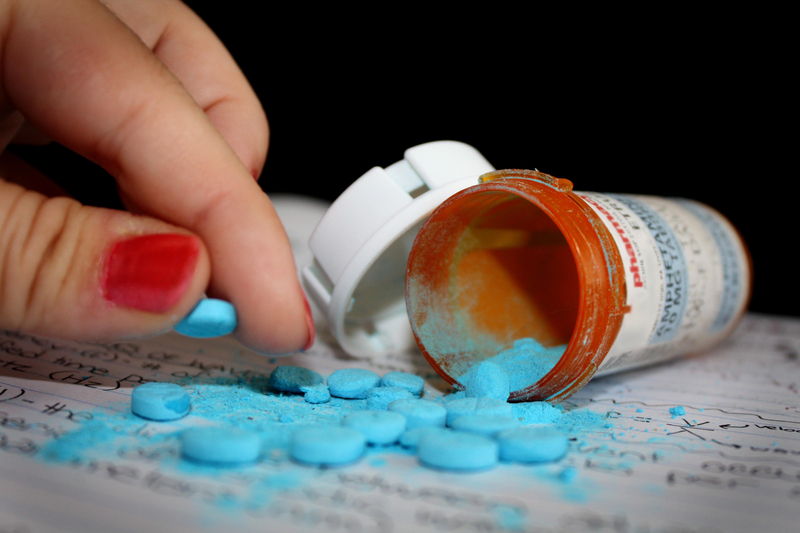 Adderall can be addictive, though, especially for students predisposed to addictions. Many who take the medication for personal use report feelings of hostility and paranoia. Overdoses of the medication, even by one or two pills, can result in cardiac arrhythmia and the body overheating. Lethal seizures and heart attacks are also risks. The other drug illegally circulating in college students’ pockets is Ritalin, or methylphenidate. It is used to treat ADD and also typically given in pill form. Ritalin works with dopamine to increase brain activity in the cortex, according to the DEA. Officials from the agency liken the results of Ritalin to the stimulating effects of cocaine. While the effects of Ritalin also boast increased focus and energy, damaging effects are more common. Ritalin abusers can feel unwarranted nervousness and paranoia. Loss of appetite and insomnia are also known side effects. Physically, the drug can bring on vomiting, nausea, rashes and dizziness. The DEA reports other negative effects, such as palpitations, headaches, muscle twitches, convulsions, abdominal pain, digestive problems and sudden changes in blood pressure. Psychologically, side effects of Ritalin can be extremely severe. Health officials report that people taking Ritalin can suffer from delusions, anxiety, paranoia and hallucinations. Habitual users may experience toxic psychosis, psychotic episodes and severe depression when trying to quit. Ritalin and Adderall can be detrimental and potentially life threatening if they are abused. Any person who takes such medications that are not prescribed to him or her, or does not have ADD or ADHD, is at risk. Cait Berry can be reached at cait.berry@temple.edu. the college life are the same stressing like the a worker….its no a excuse!! !